Full board programs available (breakfast, box lunch, three courses dinner). Day backpack (8-10 gal), walking boots for treks, sandals, waterproof jacket and pants , warm layers, sun hat, sunscreen, sunglasses, headlamp, trekking poles (optional). Reservations canceled within 30 days of the scheduled arrival date are subject to a 30% penalty of the entire stay. One of the best things about this eco camp is its location. The camp is 34 miles away from El Calafate town, right at the heart of Los Glaciares National Park where everyone would love to be: right opposite from Perito Moreno Glacier. This place is unique, and no one can get inside the property, unless the host leads them. The meeting point is at a metal bridge. You need to drive 25 miles through route number 15 in a graveled road in good conditions. You have only one split of road, please always keep your left. Please note that after departing from El Calafate, you will cross two bridges, before getting to the pointed one. Further on, you will be provided with a map and precise information. Adventure Domes is a unique eco camp that seamlessly combines the spirit of ‘Old Patagonia’ with modern luxury in an unmatched setting of natural beauty. Perched on the Colonias Peninsula, facing the mighty Perito Moreno Glacier, this is a truly breathtaking backdrop for your stay in Patagonia. The eco camp aims to create an intimate experience with the wilds of the south, allowing you to immerse yourself in unspoiled landscapes, enjoying guided excursions and sleeping on nature’s doorstep. 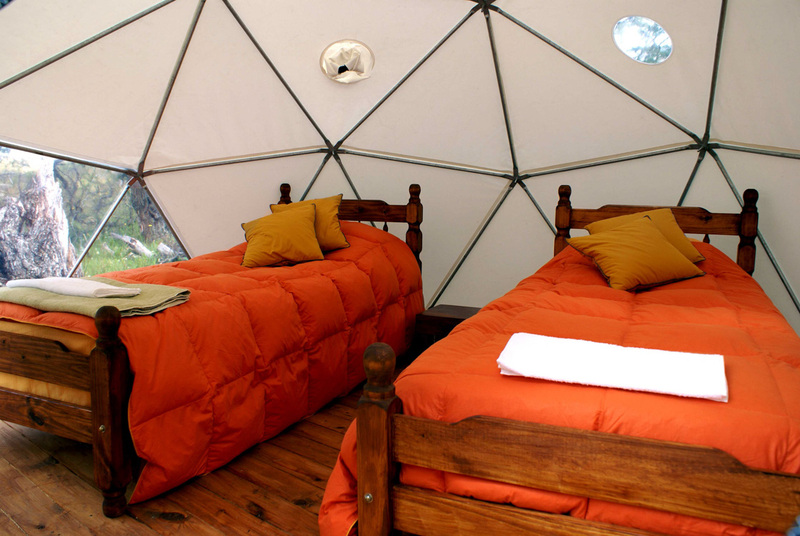 As you rest your head in one of the cozy domes, or feast by candlelight in the exclusive dining tent, you can do so safe in the knowledge that your hosts are deeply committed to sustainability and the preservation of the environment. Each unit is 15 ft in width, providing enough space to fit two guests comfortably, with twin beds, spring mattresses, and plenty of thick blankets to keep warm on those chilly Patagonian nights. Domos Triples have three twin beds inside and measure 18ft in width. Survival Kit, $120 Food provision for two people for two nights. Food list includes, bread, water, eggs, apples, bananas, cereal bars, ham, cheese, potatoes, sweet potatoes, eggplant, zucchinis, onions, tomato can, spaghetti, grated cheese, tenderloin, red wine bottle. Equipment such as dishes, camping stove, cookware set and chopped wood are included. All Meals, $120 Price for two people per day. Get box lunches (Fruit, water, Sandwich, cereal bar, candies) and three courses dinner (1 bottle per dome per night). Visit to the "Estancia cerro Moreno". Full Adventure, $630 Price for two people. Box lunch. 3-course dinner with 1 bottle of wine per dome. Visit to the Estancia Nibepo Aike (shearing demonstration, Patagonian asado with wine and dessert. Boat trip towards Perito Moreno's Ice walls. Entrance fee to National Park Los Glaciares and visit to the glacier balconies. Ice Trek Adventure, $250 Price for two people. Box lunch. 3-course dinner with 1 bottle of wine per dome. Visit to "Estancia Cerro Moreno" and tickets to a "mini trek", 1:30 hours circuit introduces you to the fascinating landscape of the glaciers. Full assistance of the crew to organize self guided treks as well as breakfast is included. Transportation and private guide are not included.